Getting kids to eat healthy is one of the most common parenting challenges. You are not alone and it is not hopeless. Acquiring tastes for different (non-sugary) foods takes time and requires parent patience. Think of it more as a marathon than a sprint. We are in it for the long-run and in time our kids will catch on. Our job as parents is to expose our kids to healthy foods – not to force our kids to eat them. The kitchen table is a place for families to come together, not a food battle field. Kudo Banz can help with this milestone! Here are some simple steps to ease into eating healthy. Award your child a Kudo charm everytime they are successful with a step. When you feel they “mastered” a step, move on to the next one. Simply tell your child “you’ve done such a great job learning how to “mastered step”, let’s work on “next step.”” Don’t worry if you are on the same step for a week or two. No rush. Keep it positive and stress-free! Try one small bite of food. Try two bites of food. Kid picks one fruit or veggie to be included in each meal. Eat all (but serve small portion). 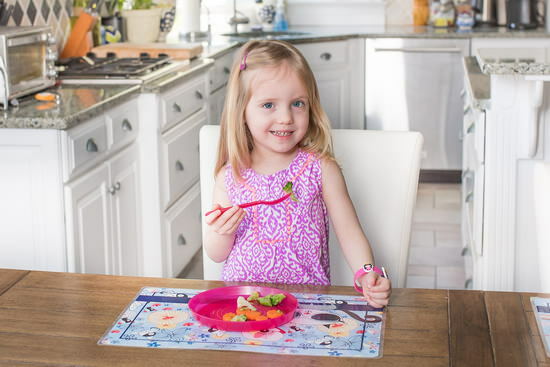 Kid picks one fruit or veggie to be included in each meal. Eat all (serve normal-sized portion). Eat the fruit or veggie served in each meal. Kid choice goes away but serve only foods they have shown success with. Of course, if it works for the meal you can give them choices so they have a part in the decision-making (“Should we have peas or corn with dinner?”). ​Add new foods to meals but only require 2-3 bites at first. Be a role model and eat healthy yourself. Monkey see, monkey do (for better or for worse). Don’t beg, threaten or bribe kids to eat their healthy foods. This sets up a negative precedent. Set and stick to the rules. Don’t force them to eat but make it clear that there is no more food until next meal if they don’t finish (or do their best). Make healthy options accessible. Pre-cut veggies and fruits so kids can easily grab them. Have them out when they get home from school or serve as appetizer before dinner. Show examples of other kids eating healthy. Have a cousin or friend over that eats healthy to show your kids it is possible! Don’t give up. It may take over 10 exposures to a food before kids are even willing to try a new food. Keep on serving the good stuff!